The Dwarfcraft Eau Claire Thunder fuzz effect pedal rectifies a few issues with other fuzz boxes, notably the need for a mid scoop. The Eau Claire Thunder fuzz is a classically styled distortion and sustain pedal, with a few Dwarfcraft twists. It scoops the mids for some cool metal tones. Toneblast bypasses the tone control, giving you more mids, and a bunch more volume. You can tap the Feedback stomper at any time to trigger a momentary integrated feedback loop for cool extra noisy flavor. The Trim control rolls back your input signal—useful in case of muddiness caused by hotter pickups. The Eau Claire Thunder fuzz pedal has the most bass of any Dwarfcraft stompbox. It also sounds amazing on bass guitars. Order now and hear it yourself. 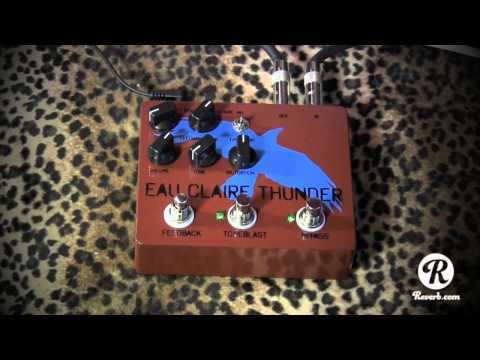 Thunderous tone is now in your hands, with Dwarfcraft Devices Eau Claire Thunder. From thick hot and heavy to thin and insane the Dwarfcraft Devices Eau Claire Thunder is about as tonally diverse as they come. Featuring 3 stomp switches for bypass, maximum tonal oscillating bliss or removing the tone circuit, a selector switch for timewarping into stoner rock and a trim pot to adjust just how nasty you want the Dwarfcraft Devices Eau Claire Thunder to play with your guitar, there really is no end to tonal possibilities.